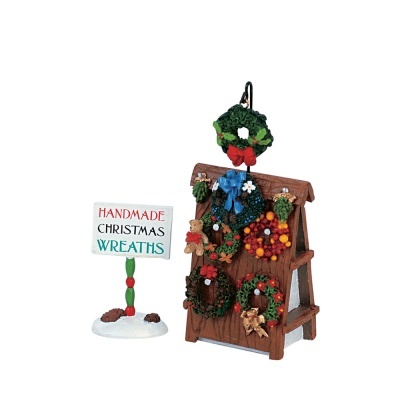 Lemax Wreath Display Accessory (Set of 2) depicts a street corner wreath stand offering for sale traditional handmade door hung wreaths at Christmas. Suitable for individual placement in a Lemax Village street display. A Lemax Village miniature accessory set which joined the Lemax miniatures collection in 2006. Wreath Display is a set of two self standing miniature resin pieces to compliment a Christmas Lemax scene.